The Gran-Cutter cuts the sprues into pellet-shape. Well loved by many customers! We are in the recycle era. Experience the powerful swing-cut system. 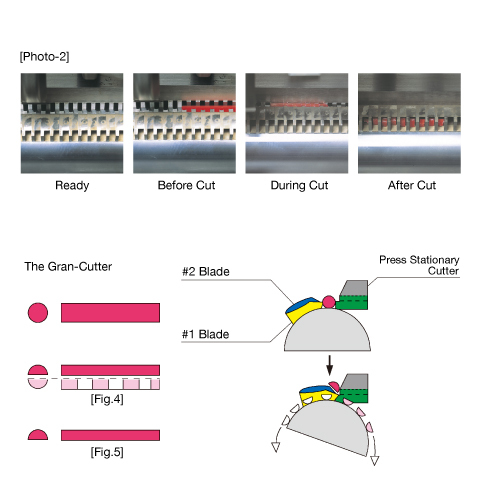 If a conventional rotary cutter granulators cut the sprues and the runners, which are thicker than the height of the blades (see the figure 1), they cut the material in comb-shape. The comb-shaped pieces tend to remain on the fixed blade and block the new sprues to go through. 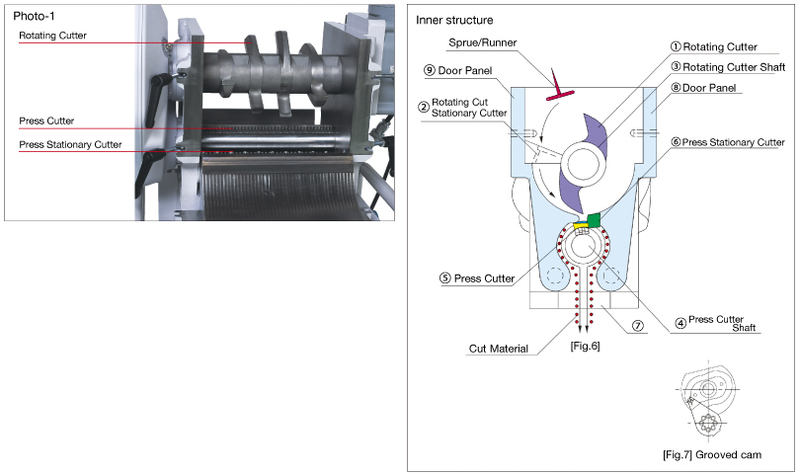 In such situation, the rotating blades need to run repeatedly and shave the materials into dust. the new sprues to go through and cause excessive dust. The Gran-Cutter has the press cutters on the cam-driven swinging shaft. 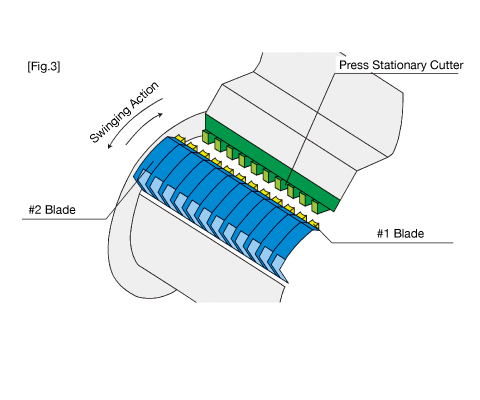 The stationary cutters are mounted where they mesh with the rotating cutters, on the circumference of the swinging shaft (see the figure 3). The rotating and the stationary cutters have their own convex and concave type blades. (see the picture-2).This completely unique mechanism minimizes the cause of generating dust, heat or static electricity. For example,the #1 blades on the press cutters cut the cylinder shaped sprues and the runners into comb-shape. The #2 blades cuts the sprues where shown with the dotted line on [Figure 4] as slicing the cylinder vertically in a half [Figure 5]. ●The press cutters out-feed the cut sprues and runners. No remaining materials. ●For a conventional granulator with screen, any fed sprues and runners, which are smaller than the holes of the screen, would fall to the bottom of the material bin even before being cut and become mis-cuts. On the other hand, for the Gran-Cutter, all of the fed sprues and runners stay on the swinging shaft and do not fall to the bottom of the bin without being cut. As the Gran-Cutter cut the sprues and runners with a 90-degree angle to the swing shaft, there is very few mis-cuts. The rotating cutter (1) and the rotating cut stationary cutter (2) roughly cut the fed sprues and runners. the motor.The press cut stationary cutters (6) press and granule the chopped sprues and runners into pellets. HARMO has answered the requests from our valued customers; to recycle the elastomers and any soft-type resins (PP, PU and PE), by developing the S-type Gran-Cutter, exclusively for soft-type resins. Until our innovative development, factories had to dispose the used elastomers instead of recycling them. Even for other soft-type resins such as PP or PU, the recycled materials were far from being satisfactory. HARMO has introduced this soft-type Gran-Cutter as the innovative solution to the concerns on the soft-type materials, which troubled our customers. 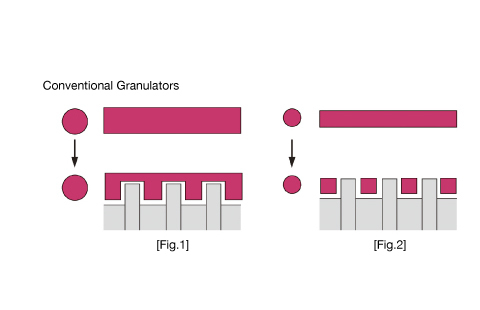 * The soft-type Gran-Cutter has limitations of usable resin types.